The nightmare began 17 days ago. I’ve wanted to blog about it but I was waiting until there was some kind of end to the story. Amara’s school had another skating party. This time I was going with them but I wasn’t going to skate. I just wanted the chance to spend some time with Jenna and Amara together. It is always fun when it is the three of us. I was planning to take pictures and hold phones and water bottles and stuff. 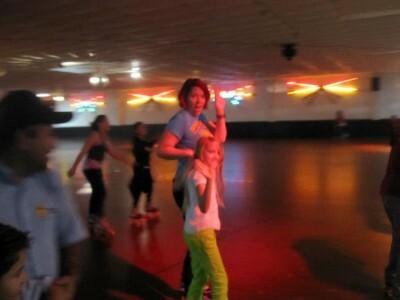 This time Jenna was going to skate. She hadn’t been able to at the last skate party because of her foot surgery. Amara and her Mommy were having so much fun. Jenna was remembering how to skate backwards and doing a great job. Amara was impressed. Unfortunately we took Jenna’s little camera instead of my big one and for some reason it was having serious technical difficulties. I thought at first it was me but it wouldn’t work much better for Jenna so I only got this one picture. Then Jenna fell. Even when your daughter is full grown with a 7 year old of her own you still panic when you see them sitting on the floor. She got up and she waved to me that she was OK but they immediately came over to sit down. She was alright but she was pretty sure she had sprained her wrist. She didn’t think it was broken but it hurt enough that we ended our evening. I helped her take her skates off but she seemed fine to drive and took me home. This was about 6 PM. The phone rang about 10. It was Justin asking if I would come over and sit with Amara who was in bed sleeping so he could take Jenna to the ER. I went over and slept on their couch until they got home about 3 hours later. It was broken. This is when the nightmare really began. ER sent her to see her regular doctor the next day. He sent her off to see an Orthopedic specialist. Now it is Friday. The Ortho doctor did X-Rays and told her she had a lateral stress fracture but he was concerned that there might be some kind of cross fracture that they couldn’t see so he wanted a CT scan to be sure but he doesn’t do those. She needs to go to an imaging center. This meant a referal from the insurance company, more forms and more waiting. Then came Thanksgiving and you know nothing got done. All this time she is still in a soft cast. Easily bumped causing lots of pain. It went on and on. Faxes kept getting lost or not sent. Phone calls kept not being returned. Finally 2 days ago, after millions of phone calls, hours of frustrations and lots of tears she finally got the approval to have the CT scan done. Yesterday they did the scan but she still had to wait one more day to see the Ortho doctor and have the scan reviewed and finally find out — did she have another break — would she have to have surgery. 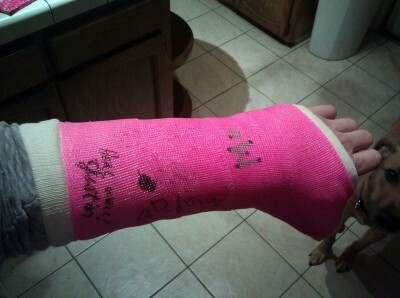 Today at 3 PM she got a beautiful pink cast and can now begin the process of healing. It has been a nightmare for her and really not her year for doctors! This memory was posted in Parent, Relatives and tagged Amara, broken wrist, Grandma, Mommy, school, skating on December 2, 2011 by Grandma Kc. So very glad there is no surgery involved!!!!! Though there has been alot of pain and suffering all along the way – oh so sorry. The system works like turtles or snails…..slooooooooow. and as you said, none of them including the drs are having any suffering or pain! it has been a nightmare to be sure. You know, I remember when we got doctoring and there was no medical insurance. We seemed to get along fine then! What happened to the good ole days! You all take care. Again, so glad surgery is not involved! Tell Jenna I am thinking of her. Thanks Sarah, I will tell Jenna! No one is gladder than Jenna that there was no surgery! And you’re right about the insurance situation, I’m just glad that she has insurance! So sorry! It is almost impossible to get anything done around Thanksgiving and the holidays. I know everyone needs to spend time with their families, but it doesn’t seem right to drag out a diagnosis like that! Thanks Susan. It sure wasn’t Jenna’s best Thanksgiving. The ordeal of getting the CT scan was just wrong! 🙁 A little common courtesy on the insurance company and the imaging center would be nice!! I’m so glad Jenna finally has her cast and can get on with healing. I knew you would have to tell everybody about Mom. Yes, I did drag her skating. I was twenty something. Mom took one step and fell. One step! I also didn’t mention that the reason I didn’t skate this time is because the last time Amara and I went I fell on my tail and it really hurt! So now you think I am jinxed or that skating is! Silly baby sister! You’re absolutely correct, no matter how adult our children, it is still a terrible feeling when we see them hurt, in pain. I’m glad she’s finally on the mend. Reminds me…when my youngest child was 16 I had an accident. I sliced my left hand open, severing a tendon and all the hand muscles on the right-hand side of the hand. It required surgery and a cast which rendered my entire left hand to remain immobile for 2 1/2 months. During my recovery, my daughter did all the cooking, laundry, cleaning, etc. all the while keeping up with her schoolwork (all AP classes, including studying for the Academic Decathlon), her music (she attended a school for the Performing Arts and played two instruments in 3 bands, and had private lessons, too), and a Shakespeare Play reading group she had founded. I think she was paying me back for having nursed her through her rather accident-prone childhood! Now that was a nightmare! We are so lucky to have such wonderful daughters to help us out (willingly) when we need them! Amara and your granddaughter will be the same way! Kind hearts. I’m so sorry this happened to her. I know those kind of medical nightmares all too well. I firmly believe that insurance companies are entirely running our health care. You should not have to wait for approval from an insurance company. You should be able to get the care your doctor thinks you need. I’m glad it all worked out in the end and I hope she heals fast. There sure was a lot of finger pointing going on through it all. I’m sure all of this will be followed up by having claims denied and having to jump through more hoops to get them paid. I agree the insurance situation is a mess. I have no answers on how to fix it; I just know it isn’t working! I think the doctor said 6 weeks for the cast. As for Amara, she is being extra helpful at home doing things for Mommy that Mommy can’t do. Have you ever tried to put in a contact lens with just one hand? Or open a can of dog food? Amara helps! That truly is a nightmare. I’m glad Jenna finally reached the end of the mess and was rewarded with a pretty pink cast. Best wishes for a quick recovery. And how bizarre that the same thing happened with your mom! Interesting twist to the story. Good luck to all of you. Not the best time in the world to deal with such a thing. But then again, is it ever. Good luck! What a scary thing… You are right, it does not matter their age when you see your baby hurt. And on the funny side, it’s good to see my photography (lack of) skill is rubbing off.